Kinesio Taping is a definitive rehabilitative taping technique that is designed to facilitate the body’s natural healing process while providing support and stability to muscles and joints without restricting the body’s range of motion as well as providing extended soft tissue manipulation to prolong the benefits of manual therapy administered within the clinical setting. Latex-free and wearable for days at a time, is safe for populations ranging from pediatric to geriatric, and successfully treats a variety of orthopedic, neuromuscular, neurological and other medical conditions. 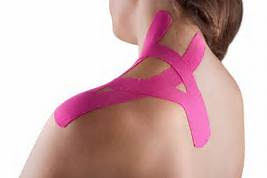 Kinesio Tape alleviates pain and allowing for a decrease in inflammation of the affected areas. With the utilization of single “I” strips or modifications in the shape of an “X”, “Y” or other specialized shapes as well as the direction and amount of stretch placed on the tape at time of application, Kinesio Tape can be applied in hundreds of ways and has the ability to re-educate the neuromuscular system, reduce pain and inflammation, optimize performance, prevent injury and promote good circulation and healing, and assist in returning the body to homeostasis. It has been proven to have positive physiological effects on the skin, lymphatic and circulatory system, fascia, muscles, ligaments, tendons, and joints. It can be used in conjunction with a multitude of other treatments and modalities within your clinic and is effective during the rehabilitative and chronic phases on an injury as well as being used for preventative measures. Find out how Kinesio Taping can help you.